Since 1994, when FIG Publication No. 8, a report entitled Hydrography, Ports and Harbours, was first published, the widespread adoption of the Global Navigation Satellite System (GNSS) and Electronic Nautical Charts (ENC) have brought on notable changes to hydrographic survey technology and how nautical data is published. The thought of publishing a set of good practice guidelines on port hydrography came to mind with awareness that in some jurisdictions the responsibility for port surveys was being divested from the national hydrographic offices to individual port corporations. In this case, some ports took up the challenge, made the investment and built their capacity to survey while others found themselves with neither the know-how nor technology or experience to conduct their own surveys and to furthermore transform their data into chart products (electronic or otherwise). Since FIG Publication No. 8, GNSS has become the premier tool for navigation and precise positioning. Terminology such as minimum under keel clearance has taken on new meaning considering the lower risks associated with navigating on electronic chart products built from high-resolution bathymetric data, corrected with real-time water level information. Tonnage is money, and increasing port capacity for increased vessel tonnage requires up-to-date and accurate hydrographic information. The intent of this new publication is not to bury the reader with excessive detail, but to provide an overview of current hydrographic survey technology and techniques and to point out authoritative sources for information relevant to the execution and management of hydrographic surveys in ports and harbours. For this I would like to thank the members of Commission 4 Working Group 4.1, members of the Hydrography Commission of the Surveying and Spatial Sciences Institute (SSSI), the Australasian Hydrographic Society and the New Zealand Institute of Surveyors, for their efforts in compiling this new publication. The New Zealand Institute of Surveyors, Wellington New Zealand. Hydrographic surveys of ports and harbours are undertaken primarily to support the safe navigation of vessels. Port authorities are charged with maintaining and developing their harbours with regard to harbour use, and the size of vessels the harbours accommodate. This duty of maintenance covers several specific requirements, including the execution of hydrographic surveys. 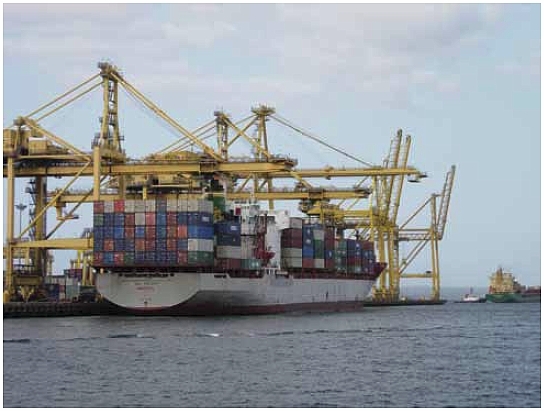 To meet increasing demands for volume and efficiency, ships are becoming larger and, with maximum loading, under keel clearances are diminishing. Consequently, there is an increased burden of responsibility on port administrators and surveyors to ensure that hydrographic surveys are undertaken to appropriate standards by appropriately qualified personnel. Accordingly, these guidelines have been prepared to provide an overview of good practice for port administrators and surveyors striving to develop the capacity to either conduct their own hydrographic surveys, or to contract this work to a third party. The guidelines are intended for use in ports and harbours where hydrographic surveys are carried out to support safe navigation of vessels. They are based on widely accepted good practice for the planning, execution and management of hydrographic surveys. The guidelines should be used by those responsible for the provision of hydrographic information when determining the hydrographic aspects of risk relevant to the safe navigation of vessels within their jurisdiction. Standards and guidelines for hydrographic surveys relating to safe navigation generally fall into one of three levels, each with differing content and application. The overarching standards, the highest level for hydrographic surveys, are those adopted by the International Hydrographic Organization (IHO). They form the basis from which IHO member states can produce their own national standards, and are intended to ensure a consistent quality of hydrographic information contained on internationally recognised nautical charts. The set of minimum criteria that must be met to achieve a recognised level of accuracy, or ’Order’ of survey, is set out in Special Publication No. 44 Standards for Hydrographic Surveys (S-44), produced by the IHO, and now in its fifth edition. Typically, Special Order, or Order 1, applies to surveys of ports and harbours. Order 1 does not provide detailed survey methodology, but it does include broad guidance on key areas. The IHO Manual of Hydrography (M-13) provides more specific details of the application of surveying methodology. Reference should be made to S-44 for standards relating to the broader science of hydrography, and particularly for authoritative definitions of common hydrographic terms. S-44, and the Manual of Hydrography, can be downloaded from the IHO website at http://www.iho.ohi.net/. Second level or National standards are produced by IHO member states. They are predominantly based on S-44, and modified to suit each country’s unique requirements. These standards are usually quite detailed and contain considerable prescriptive processes. Similar to S-44, their purpose is to provide minimum standards for the capture of hydrographic survey data to support the production of official nautical charts. Third level guidelines and standards are often produced by agencies and organizations to describe good practice and procedures for specific hydrographic surveys. The scope of such guidelines is often narrower than national standards, and focuses on key areas of hydrographic surveying that support a particular type of operation, e.g. hydrographic surveys in support of port operations. The United States Army Corp of Engineers, for example, publishes a document pertaining to pre and post dredging surveys. sea state (wave height), direction & tidal stream. The hydrographic surveyor contributes to the measurement of factors such as tidal height, accuracy of declared depth, and the required frequency of hydrographic surveys. The surveyor may also contribute expertise necessary for the measurement of a vessel’s squat and roll, pitch and heave movement. Various methodologies exist for the collection, processing and presentation of hydrographic survey information. Whilst the presentation of such information is largely determined by the needs of the end user, the fundamentals of hydrographic data collection remain the same, i.e. the accurate measurement of water depth (Z) below a stated datum, and the position of this measured depth (X,Y). Additionally the hydrographic surveyor would be concerned with determining bottom type and as well the positioning of “intertidal” and shoreline features above a stated datum. The widely accepted method for obtaining depth data has been with a single-beam echo sounder (SBES), with position provided by electronic ranging equipment. Positioning has been made easier with the advent of the Global Positioning System (GPS), particularly in differential (DGPS) and real time kinematic (RTK) modes. The introduction of the multi-beam echo sounder (MBES) has provided the ability to ensonify and measure much greater areas of sea floor to a higher level of detail, but it also requires greater knowledge to use this technology effectively. As all hydrographic survey data has some degree of uncertainty, it is important to ensure that charted depths are accurate, and that the charted depth tolerance is commensurate with the allowance made for under keel clearance at the port. S-44 requires that hydrographic surveyors include with their survey data, a statistical estimate of the probable error. It is important that the estimate of the depth error is based on the survey methodology adopted; the equipment used to perform the survey, and is unambiguously reported for each survey undertaken. Furthermore IHO S-57, the current standard for electronic nautical chart (ENC) data exchange prescribes standards for encoding metadata to identify areas based on specific depth and positional uncertainties called Zones of Confidence or ZOC. The varied and dynamic nature of ports and harbours dictates that the frequency and methodology for hydrographic survey operations should be determined primarily by a risk assessment, rather than by the blanket adoption of a set of rigid criteria. The usefulness and credibility of associated risk assessments largely depend upon the quality of the balanced and quantifiable information on which they are based. Hydrographic factors for consideration in risk assessments should take account of the stability of the seabed and depth of available water in relation to vessel draught, as well as intended development that will affect the navigable depth in a given area. competency of persons responsible for the surveys. Equipment to be used during hydrographic survey operations falls within the broad groupings of equipment to measure depth, to establish position, and to measure water level (e.g. automatic tide gauges). Generic considerations for the use of such equipment are covered in this section. Advances in survey equipment technology have enabled some processes to be automated, thus significantly reducing the level of user input in normal modes of operation. It is vital, however, that users possess a reasonable understanding of the capabilities and limitations of the equipment used. In particular, it should be understood that manufacturer’s specifications rarely guarantee equipment performance, unless the equipment is operated in accordance with strict parameters and under optimum environmental conditions. Regardless of the manufacturer’s stated specifications, in accordance with principles of good practice, the surveyor is still required to identify, eliminate or reduce, and quantify remaining sources of error in an appropriate error budget. As Total Propagated Uncertainty (TPU) values are often estimates based on the claims of manufacturers, these can be difficult to formulate correctly for a dynamic vessel. It is therefore suggested that a priori TPU is used to determine whether the proposed system-package is capable of meeting the required specifications. A more quantifiable measure, however, should be used to derive the post priori precision (e.g. from comparison of the results of tie line/interline and previous data). Depths are normally measured using either single-beam (SBES) or multi-beam (MBES) echo sounders. Complete seabed ensonification for the purpose of small target detection can be achieved when these systems are used in conjunction with a towed or fixed side scan sonar system. It should be noted that SBES is still the most common tool used in port and harbour surveys and will continue to give valid results when used correctly in a well planned and executed survey. Multi-transducer, single beam (Sweep) systems are becoming less popular in favour of shallow water, wide swathe or dual head multi-beam sonar systems. However, until capital and operating costs reduce significantly, it is unlikely that, in the short term, MBES will replace SBES for routine surveys in the average port or harbour. SBES must be calibrated by a bar check to correct for errors in the speed of sound in the water column, and to set the correct transducer draught. The latter is to ensure that the instrument records the depth below the sea surface and not below the transducer. Where no sound velocity profile data is available, a bar check should be conducted at least daily, and on any change of survey area during the day, to ensure consistent data quality. Likewise a bar check must be conducted when any SBES components are modified or replaced on the vessel. MBES as a hydrographic survey tool has significant advantages over SBES in its ability to detect small objects and achieve full bottom coverage. It requires key ancillary equipment such as an appropriate motion and heading sensor, which must be properly integrated for correct operation. The ability to measure sound velocity (SV) profiles through the water column (in some cases continuously) is required to correct for the refraction of beams, particularly where shallow water systems employ wide swathe widths. MBES with flat transducer arrays also require an accurate instantaneous measurement of the sound velocity at the transducer face to enable correct beam steering to occur. Users should be aware of the expected performance of the system and employ robust methodology to prove this before accepting the system as operational. Careful calibration of MBES is required at regular intervals thereafter. Good practice calls for the use of a reference surface, an area of seafloor where repeatable measurements can be compared. Inherent with the increased detail and coverage achieved with MBES is the ability to clearly see errors associated with incorrect lever arm and sensor offsets, time delays, sound velocity and excessive vessel motion. The ability to ‘average’ or ‘smooth’ out such errors in subsequent processing is potentially misleading and should be avoided unless the magnitude of the change from the raw to the smoothed record is clearly stated. Such errors should be included in the calculation of the overall accuracy value accompanying the data. Differential GPS is widely used to fix vessel position during hydrographic surveys. The source of the differential corrections should be proven by comparison with a known survey control point, particularly if a local base station is established. GPS receivers should be configured to output positions in the desired datum (normally WGS84) with associated quality tags. The quality of the position fixes should be monitored during sounding operations through examination of the GPS parameters in use (number of tracked satellites, dilution of precision (HDOP and PDOP), etc), and real-time comparison with a second positioning system is recommended. Post-processed differential is an alternative to RTK in instances where a high accuracy positioning solution is required. Users can navigate with a Satellite Based Augmentation Service (SBAS) such as WAAS while logging raw GPS aboard, and simultaneously at a reference (control) station ashore. Real time kinematic GPS offers increased precision of the horizontal position, provided that the footprint of the echo sounder in use is of a comparable dimension. Users of the sounding data need to be aware that the horizontal accuracy quoted for an RTK GPS survey (or any other positioning system) may be affected by the beam width of the echo sounder. If the beam width is large, an increase in depth will increase the footprint on the seabed and degrade the actual positioning of the soundings. This is, potentially, more of a problem with SBES as MBES beam width is usually much smaller. Additionally the accuracy of position of the soundings will be improved with the use of motion sensor equipment. The demand for greater transparency in the derived accuracy of soundings taken in swell conditions has seen the use of motion sensor equipment become standard in an increasing number of port and harbour surveys. The accelerometer is the standard type of motion sensor equipment, and different units range in their complexity, and in the precision they are capable of achieving. The correct installation and definition within the vessel reference frame is vital, and consideration should be given to obtaining assistance from the manufacturer if the user is unfamiliar with the equipment. Kinematic GPS is becoming increasingly popular as an alternative method of correcting vessel motion, either in conjunction with, or in lieu of, accelerometer-based motion sensors. While providing a low cost alternative for measuring roll, pitch and heading, the update rate of the GPS (typically 10Hz) limits its ability to serve as an accurate heave measurement sensor. Thus, users of both types of motion sensors should take all practical steps to check their correct operation, preferably by some means of ground-truthing (e.g. quantifying the motion error residual in data collected over a known flat seabed). Sea level (tide) measurements of height and time are required to reduce collected soundings to Chart Datum, and they are subsequently used (as a continuous record over long periods) to define tidal reference levels (e.g. MHWS). Tidal observations are normally obtained via automatic recording gauges, which are permanently installed in many ports. Other methods used to obtain tidal information include: manual tide pole (or staff) readings, referenced to a recognised datum (normally Chart Datum); and RTK GPS with centimetric precision in the vertical (Z) dimension. This latter method provides a total height measurement, including tide height, but the geoidal separation must be accurately known, and the base station-rover range limitations clearly understood. If Kinematic GPS is used in this manner, it is considered good practice to regularly correlate the results against tidal observations obtained by traditional (e.g. tide gauge) methods. Regardless of the type and method used, the equipment must be capable of measuring the tide to the required accuracy. If the method of tidal reduction requires interpolation between individual observations, the interval between observations must be such as to provide an adequate representation of the tide curve. If automatic tide gauges are used, these must be regularly calibrated against a staff gauge to ensure their accuracy. The accuracy of the tide readings used to reduce soundings impacts directly on the overall accuracy of the survey. In addition to the use of tide readings to reduce sounding data, a continuous record of tidal data (at least one lunar cycle of measurement) is important for the maintenance of accurate predictions for the port. It is recommended that an unbroken record of tidal readings is maintained and archived (accompanied by relevant calibration records) for this purpose. The position of the various sensors on the survey vessel should be carefully measured in relation to a common reference point, and correctly applied within the survey acquisition or post processing software. This information must be included in the survey documentation. Furthermore, it should be noted that not all equipment and software engineers adhere to the same conventions when applying the axes and arithmetic signs used to describe a vessel’s [Cartesian] reference coordinate system. Preparation for the survey involves the planning of hydrographic observations and ancillary activity necessary to support the collection of data, the most important of which is calibration of the surveying equipment. Equipment calibrations need to be conducted at regular intervals and documented in order to support the quality estimate given to the final survey dataset. Maintaining a data-pack for key equipment, and/or including the relevant information in a final report accompanying each survey, is recommended. Calibration of SBES is normally achieved by the bar check method whereby a bar is set horizontally beneath the transducer on marked lines at pre-determined depths, and the echo sounder recorder is adjusted so that the echo trace from the bar appears at the correct depth as determined from the lowering line marks. Details of this method can be found from references such as the Admiralty Manual of Hydrographic Surveying, Hydrographic Department, (UK) Ministry of Defence, 1965, or Ingham, A.E., Hydrography for the Surveyor and Engineer, 2nd Edition, Crosby Lockwood Staples, London, 1987. Initial calibration of MBES equipment is a complex task. It is strongly advised that assistance is sought from the manufacturer, and, if necessary, a hydrographic surveyor with MBES experience. Individual MBES error tolerances are much smaller than for SBES. The results will only be as good as the accuracy of the sensors installed in the system, and the quality of each sensor with respect to the manufacturer’s quoted accuracy. Check calibrations or rigorous confidence checks are required at regular intervals, starting at daily intervals for newly installed systems, and after significant component upgrade/change to key sensors. Once repetitive results for calibration values are obtained, checks should be carried out weekly and monthly. It is recommended that each organization performing surveys with MBES set up their own regular calibration and inspection/maintenance regime, and employ a reference surface for ongoing system calibrations. The surveyor needs to become intimately familiar with all the aspects of the system to be able to locate and understand small variations in data quality. As a minimum, full calibrations should quantify the system error sources. It is good practice to confirm automatic gauge readings with the level of the tide observed on a co-located tide pole or tape, referenced to Chart Datum, at least weekly, if not daily, during survey operations. These comparisons provide a valuable record of the gauge performance and should be retained (e.g. in the equipment data-pack). Where a permanently recording automatic tide gauge is installed, a full calibration of this system should be conducted at least annually, or when necessary after maintenance etc. This procedure involves manual observation of the pole readings over a full tidal cycle (preferably 25 hours although 12.5 hours may be sufficient) in order to correlate gauge readings with the theoretically ‘correct’ pole readings. Further information can be obtained from standard references such as the Admiralty Manual, or Ingham, A.E. referred to in section 7.1 above. Regardless of the type of automatic gauge equipment being used to observe tidal data, confirmation of the tide pole zero against the Standard Port Reference Benchmark should be carried out by levelling at least annually, or whenever the pole is moved. Results should be fully documented, and retained with the tidal archive and/or equipment data-pack. Likewise, the benchmarks that reference the vertical datum should be checked regularly for movement by a closed levelling loop. Regular confidence checks of the vessel positioning system should be conducted atleast weekly, preferably daily, during the course of a survey. A static check of the vessel’s derived position against a mark ashore (e.g. a pin on a wharf ) established to a higher order of accuracy than that required for the vessel is recommended. In both SBES and MBES systems, position system latency (time delays) should also be determined and applied in the survey acquisition or post processing software. Guidance on determining the latency correction can be obtained from the equipment manufacturer. Most modern MBES systems use PPS (Pulse Per Second) timing from a GNSS system to reduce latency down to the millisecond level. If possible, a dynamic check against a distinctive bottom target for which a known position has been derived, should be undertaken, as this serves to reveal any latency or vessel layback errors not otherwise detectable with a static check. Bottom targets should be located in shallow (i.e. less than 10 m) water to ensure the echo sounder footprint and subsequent resolution of the target is comparable with the positioning system in use. Calibration of ancillary equipment, such as SV probes, should be carried out by the equipment manufacturer or agent in accordance with the manufacturer’s guidelines and copies of subsequent certificates should be retained in the equipment data-pack. Hydrographic surveys within a port are undertaken for a variety of purposes, so in the initial planning stage, it is important to establish who will be the end user of the data. For example, will the data be used for discovery, charting, safety of shipping, clearance, under keel clearance, dynamic under keel clearance, volumes etc? Each end use will have different requirements for the equipment used, accuracy and precision, and processing and presentation. Some hydrographic standards prescribe rigid procedures and criteria, but these may not be appropriate in the port and harbour environment where repeat surveys are regularly undertaken, and such rigid requirements can be considerably relaxed. For example, survey line spacing may be increased when conducting repeat SBES surveys where the likelihood of undetected shoals is minimal. Different methods for sounding are required when using either SBES or MBES. In general, the traditional methods, which involve soundings taken along parallel lines, at set distances apart according to the desired scale of the final survey chart, apply to SBES, but are not necessarily appropriate for MBES operations. Significant differences of methodology for MBES operations include the orientation of the survey lines in relation to depth contours, and the varying of line spacing dependent on the least depth of water, which determines the effective swathe width. Regardless of the type of equipment used, the running of additional lines (check or cross-lines) for the sole purpose of validating water level or tidal reductions is considered essential. It is important that the limitations of the survey equipment used are fully considered during sounding operations. In particular, the performance of motion sensor equipment should be carefully monitored, and survey operations suspended when it is apparent that the equipment is not coping with existing sea conditions. This is particularly important in MBES operations where error tolerances are much smaller. The tidal regime varies greatly from port to port, and will often require different survey methodologies to enable appropriate tidal reductions to sounding data. The ‘hydraulic gradient’ across a survey area can be considerable, particularly in estuarine-dominated harbours. The use of multiple gauges to quantify and, if necessary, correct for such an error source, should be considered. Many hydrographic survey-processing packages have co-tidal functionality that can be used to correct for this effect. An imprecise value for the velocity of sound in water during sounding operations is a potential source of significant error, particularly with MBES applications, and this should be quantified and, if necessary, an allowance made for the error. The effects of squat and settlement on the small vessels typically used for sounding operations in ports and harbours are likely to be significant, particularly where the vessel survey speed is above 5 knots in shallow water. The various techniques used to determine the magnitude of this error normally involve accurate measurement of the apparent change in vessel draught at various vessel speeds. It is recommended that trials are conducted to quantify squat and settlement, and corrections applied if appropriate. Provided an accurate geoidal separation model can be computed for a given area, the use of GPS, either real-time or post processed kinematic for precise vertical measurement, provides an effective means of measuring and applying the sum of tide, squat, vessel draft and local anomalies. The processing of hydrographic survey data involves the removal of erroneous data, and through the selection of valid data, the preparation of a ‘cleaned’ data set for further processing, or for the generation of required products (e.g. sounding sheets) for subsequent analysis. It is also the stage where tidal data is normally applied, or where water level data collected and applied in real-time data acquisition (e.g. from RTK GPS) is validated. Typically, the practice of running survey check lines will serve to provide a comparison data set to validate the applied tide reductions, and as well, detect any changes in vessel draft or squat. It is recommended that data is processed using a dedicated hydrographic processing package that preserves data integrity through audit functions, and is capable of shoal bias thinning. Modern packages offer almost complete flexibility and the potential to ‘manipulate’ or overly ‘smooth’ data – this practice is potentially misleading and should be avoided unless the magnitude of the change in the raw to the smoothed record is clearly stated. In general, data should be BINed (clashed) rather than gridded, so that observed depth XYZ’s are preserved. Some software is able to preserve shoal depths during the smoothing process; however, for charting the CUBE (Combined Uncertainty and Bathymetric Estimator) surface may be acceptable, while for volumes, a grid of average depths is generally required. Where sounding (i.e. field) sheets are produced from gridded data, the surveyor should refer to the manufacturer’s instructions accompanying survey processing packages and develop a series of standard operating procedures for the processing of data, mindful of the above considerations. Where possible, standard nautical hydrographic symbology should be used on survey sheets; in particular, the standard convention of displaying depths as metres and decimetres where the decimetre is shown in subscript form should be followed (e.g. 56 instead of 5.6). Data collected during survey operations should be monitored closely to ensure that the required standard, and the desired extent of coverage, is being met; however, it is not possible to fully assess the overall quality of work until all data can be viewed together or in suitably sized blocks. Cross-line or check-line comparisons and various other consistency checks are undertaken at this time. Areas requiring re-running, either because of gaps in coverage or due to suspect data, is identified at this stage. Perhaps the most crucial aspect of data analysis is the assessment of the accuracy achieved. Soundings on a chart, sounding sheet, or other plots used as decision aids in navigation (including post dredge surveys), are meaningless without associated information on their quality. The accuracy of soundings cannot simply be estimated without proper justification. In determining depth accuracy, all sources of individual errors need to be quantified and incorporated into a statistical model to derive the ‘Total Propagated Uncertainty’ (TPU). Individual error values should be derived from the various calibrations conducted at the preparation phase and throughout the survey, and be appropriately documented. the name of surveyor/agency who conducted the work. an assessment of horizontal and vertical positioning accuracies (Survey Order or CATZOC). Most of the above information can easily be incorporated on the sounding sheets using a simple template. Metadata that is impractical to show on sheet templates, e.g. calibration procedures and results, should be documented and stored in a manner that allows it to be subsequently recovered if necessary, to confirm data quality. This requirement could be achieved through the use of a separate report. Most national land based mapping is now referenced to the WGS84 Datum (or a very close approximation of it), and horizontal control and positioning is generally measured using precise GPS-DGPS, RTK, P-Code or PPS, or Wide Area DGPS derived from a Satellite-Based Augmentation System. (SBAS). However, care should be taken to differentiate between datums used in acquisition and subsequent charting such as ITRF, WGS84, GDA94 and NZGD2000. For example, GDA94 (Geodetic Datum of Australia 1994) is based on ITRF92 at epoch 1994.0 and as such is fixed to the Australian continent, which is drifting at about 7cm per year. Therefore the WGS84 coordinate for a position measured today, will differ from its GDA94 equivalent by over 1.0 metre. This is important where WGS84 based positioning is in use from SBAS GPS systems (such as Omnistar-USA, CDGPS-Canada, EGNOS-Europe, MSAS-Japan and GAGAN-India), or Post Processed Kinematic GPS, as opposed to positions fixed from, and referenced to, current land-based datums such as GDA94. At a particular port, the level of the water is expressed as a height above a local datum, which is also the datum used for the depths of the sea on nautical charts (Chart Datum). This datum is defined with reference to permanent benchmarks ashore and the adopted zero of the tide gauge. The datum adopted should, according to IHO standards, approximate Lowest Astronomical Tide (LAT), which is the lowest level the tide can be predicted to occur under normal meteorological conditions. Although LAT is commonly used as the Tidal and Chart Datum, a common practice is for the Port Datum to be based on the water level required to obtain a certain percentage of submergence – typically 95% to 100%. In locations where environmental effects (seiches, short-term meteorological effects, Southern Ocean Oscillation, etc) are significant, the Port Datum will necessarily fall below the LAT datum. In addition to paper plots and reports, digital data is an output from most modern surveys. This primarily comprises point information for each sounding, but can also include coastline, sound velocity, tide etc. Standard formats for the archival and distribution of this data are encouraged. All hydrographic survey packages are capable of outputting sounding data in ASCII format: as latitude, longitude and depth; or eastings, northings and depth. To facilitate future sharing and use of the data, preference should be given to archiving this sounding information in ASCII format, using WGS84 latitude and longitude, and depths below Chart Datum. The archival of line information (e.g. coastline) or certain point information in Drawing Exchange Format (DXF) is accepted practice; however, this format should not be used for sounding data, as the subscript decimal place used in standard hydrographic sounding presentation is not fully supported. Preferably line information could be archived in IHO S-57 object format. The nature and extent of hydrographic surveys required to support safe navigation in a particular port or harbour, should be determined primarily by a risk assessment. The same risk assessment process should also address the minimum level of competencies required by those charged with the conduct of such work. 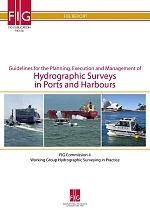 Guidance on competencies appropriate for particular hydrographic surveys is detailed in IHO Publication S-5 Standards of Competence for Hydrographic Surveyors, now in its 10th edition, and includes guidance specific to the port and harbour environment. It can be downloaded from the IHO website (http://www.iho-ohi.net). Formal qualifications supported by practical experience, certification by a recognised professional body, or demonstrable experience, are all valid means of determining an individual’s level of hydrographic competency. These are outlined below. Professional qualification as a hydrographic surveyor is normally achieved by completion of an IHO/FIG/ICA Category A Hydrographic Surveying course. Such courses provide international recognition of a wider level of competencies than might be required for a specific port and harbour environment. The IHO/FIG/ICA Category B qualification gives recognition of technician level hydrographic survey knowledge and a reduced level of competencies. In lieu of completing a Category A or B course, competence may be demonstrated by certification from a national professional survey body. Specialist certification in hydrography is official recognition that a person has the necessary knowledge to perform hydrographic surveying tasks, and the demonstrated ability to apply that knowledge. This is of particular significance in instances where a surveyor has not completed a Category A or B course, but has academic qualifications such as a Bachelor’s Degree or Diploma in Surveying and appropriate experience applicable to the work he/she is engaged in. To date, there are three national organisations that offer a certification for hydrographic surveyors: The American Congress on Surveying and Mapping in collaboration with The Hydrographic Society of America (www.acsm.net), The German Hydrographic Society (www.dhyd.de) and the Australasian Hydrographic Surveyors Certification Panel (AHSCP). The AHSCP, which was formed in 1993, is jointly sponsored by the Surveying & Spatial Sciences Institute of Australia (SSSI) and the New Zealand Institute of Surveyors (NZIS). Since its inception, the AHSCP has assessed some 180 surveyors, and its certification is increasingly recognised in Australia, New Zealand, and internationally. Certification of hydrographic surveyors by the AHSCP is now regularly specified in government and port authority contracts, in hydrographic surveying guidelines, and as a pre-requisite for employment within the industry. It is understood that other professional bodies and societies, particularly the Royal Institution of Charted Surveyors (RICS), the International Marine Contractors Association (IMCA), and the Association of Canada Lands Surveyors have investigated the establishment of hydrographic surveyor certification schemes. In many ports and harbours, the personnel charged with the conduct of hydrographic surveys do not possess formal survey qualifications, or have any recognition by a professional body relating to hydrography. Such personnel would normally be ‘self taught’ and have, in some cases over many years, developed competencies specific to the work being carried out. In these instances, it should be demonstrated that personnel conducting hydrographic surveys possess the appropriate broad-based knowledge and comprehension of the aspects of hydrography considered necessary by the risk assessment. Where possible, this should be achieved by periodic external audit by an experienced Hydrographic Surveyor with either IHO/FIG/ICA accredited training or appropriate certification. Both the Australasian and American certification models provide for a second tier process whereby surveyors who have not graduated from an accredited hydrographic training program may apply for a certification based on their years of experience. 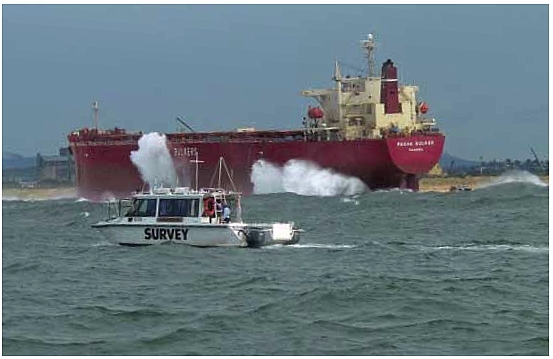 The Pasha Bulker (a coal carrier) ran aground off Newcastle in 2007 during a significant storm event and surveyors from the Newcastle Port Corporation were actively involved in trying to refloat her. A hydrographic survey was conducted through the surf zone which contributed to the salvage efforts for refloating the ship. © Courtesy of Newcastle Port Corporation, Newcastle, New South Wales, Australia.